Karthik gave it to us as a gift cos you know he works at Google and so he’s this huge Google advocate. 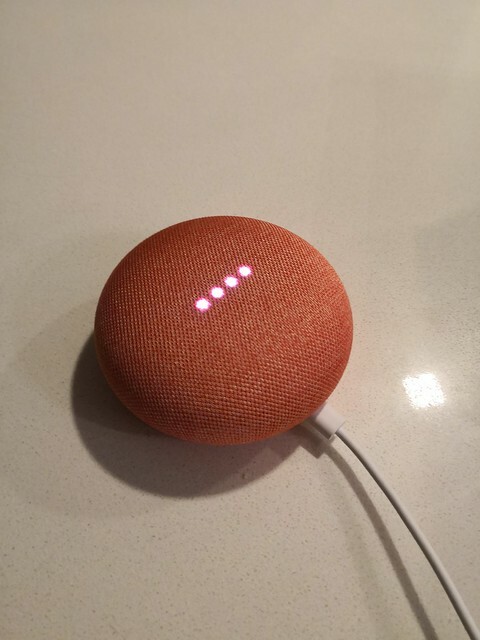 Google Home is basically the Google version of Siri or Alexa and you can hook it up so it’s connected to and controls your household functions. We haven’t done much to it yet so it’s so far hooked up to our TV only. But you can still do quite a bit with it. You can speak to it and ask it questions. And of course we use it to turn on Netflix or certain movies for the kids. There’s also a game called Akinator where you think of a character or person and Google basically asks a bunch of yes-no questions which you’re supposed to answer, and through some elimination algorithm, guesses correctly your person. Fighter loves this game. So far he’s asked Google, and Google has guessed correctly probably the only two famous people he knows – Superman and Psy. Hahahahah. Penny doesn’t understand this yet wtf. This is not a story about Google Home. This is a Funny Fat Her Story (see blog categories wtf). So my parents were over the other day and Fatty was showing them our Google Home. He suggested they play Akinator so my mom went first. I can’t remember who she picked already but as usual Google Home got it right and everyone was laughing and amazed with it. He proceeded to play Akinator and answer the questions Google posed to him ….. until I realized that the person he was thinking of was Fighter WTF. OMG HAHAHAHAHAHA I was super annoyed but also cannot stop laughing hahahahaahha. Some more when Google asked, “Is this person on Youtube?”, my dad answered, “Yes” because of my vlogs WTF HAHAHAHAHA LAUGH DIE ME. And you know the best part is? Because I was berating my dad that he needs to pick someone famous, for a few days after that Fighter has been asking me: “Mommy, why am I not famous? How to become famous?” Thanks dad. And that is a Funny Fat Her Story for you. Sorry I haven’t been blogging! I think this is my longest hiatus yet. I’ve been super super busy and when I had time I just wanted to watch Westworld or The Handmaid’s Tale you can blame TV for my absence wtf. But this week is the last week before our deadline to finish Colony Eco City! Watch out for a blog post or another vlog when it’s done. Until then babai. P/S: If you still want to see what I’m the kids are up to, there’s always Instagram Stories! @fourfeetnine yo.